Liangjiang Brand-barite powder is made through the advanced domestic and international production process, with ultra physical and chemical processing of selected barite. Thanks to the advanced production technology, the particle size is strictly controlled in a narrow range; the use of advanced drying technology, the physical properties of the products are excellent, of good dispersion and affinity in the application process with other intermediary agent. 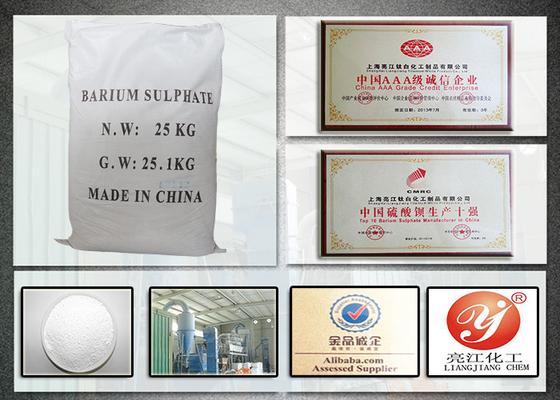 Coz of higher whiteness and purity, and no other mechanical impurities, our ultrafine barium sulfate is of the top quality and performance in domestic products. It can absorb X rays, gamma rays, and give the high material the density and surface finish, which is widely used in paint, ink, paint, plastic, rubber, chips, friction plate, ceramic, glass, electronics, cosmetics, medicine, food and other fields. 25 kg n.w. per plastic woven bag; or 500 kg / 1,000 kg as clients’ requirements. This product is safe and harmless, white powder. To prevent the moisture in the process of transportation and storage, the goods is suggested to be placed in the cool, ventilated, dry place. Avoid inhaling dust when handling, wash with soap and water if sticked and reference material safety technical data. Liangjiang Brand- barite powder use high grade barium sulfate ore, characterized by the characteristics of lower hardness, lower hardness, simple procedure and lower cost.. Due to the industrial production of precipitated barium sulfate of large size, high cost, and has a light shield, it was formed in the coating of dry paint film, often poor transparency, surface gloss is not good, bond is not secure. The performance of the above problems can be solved by using ultra fine barium sulfate.. Ultrafine barium sulfate refers to the average particle size of a particle in the range of 10~100Lm, and the particles of the following 100Lm are above 90%.. Its outstanding features are: excellent optical performance, good dispersion, good adsorption property. Ultrafine barium sulfate can also improve the fluidity of coatings and prevent precipitation and other characteristics..